When doing your research about drywall you may observe that there is a lot of information out there when it comes to this industry. Usually, your next questions sound more like this: why drywall and why this contractor in particular? Today we are going to discuss exactly this. Drywall is great for creating rooms in a residence, industrial or commercial property. It is price friendly, efficient and at Drywall Pro-Finishing we make sure the job is done right. We really do take our time constructing your walls but at the same time we make sure that they are there to serve you. 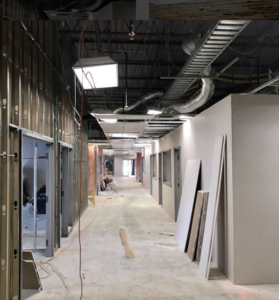 For commercial properties, drywall is better than cubicle walls because it allows the person occupying the room to have more a room-type of feel with an actual door. Depending on the type of drywall, you can get it insulated to have it sound proof so people can get their work done in quiet. For residences, drywall is great to create rooms for your children, guests, and for other multipurpose reasons. The properties that we have done have outstanding rooms that really do bring up the value of your property because we make sure that your walls look proper and done right if you want to sell later on. Additionally, creating rooms out of drywall is also great for your basement renovations that will also definitely bring the value of your property up. Indeed, even for industrial properties drywall rooms are great. As mentioned, they create separate work-space rooms for workers to operate in and not get distracted. At Drywall Pro-Finishing, we do many different kinds of properties, so why not give us a call today to find out how we can construct the rooms that you were always looking for? Now, let’s move on to why you should choose us as your drywall contractor? At our drywall company we are passionate at what we do and we have been serving the Greater Toronto Area (GTA) for many years. Certainly, there are contractors that do this as a side-job but this is never the case for us. Drywall is what we are about. We make sure that we built a strong relationship with our customers and keeping in mind time, budget, and resources available. For us drywall constructing is not an experiment, it is our profession. There is a reason why there is the word Finishing in our name and that is because we get things done and once it is complete we make sure that everything is in place & clean to the point that you can sit back and enjoy your new rooms. And, finally, we love to communicate with our clients before & after the job so that if you have any questions, we are here for you all the time. So, why not contact us today to hear about how we can finish your drywall and drywall-related projects today? Stay tuned for more drywall info, advice & news from Drywall Pro-Finishing! This entry was tagged choose, drywall, GTA, toronto, type. Bookmark the permalink.